Where N 0 is the initial number of individuals, N t is the number of individuals at a future time, r is the rate of increase, t is time, and e is the base of the natural logarithm (roughly 2.718). The rate of increase ( r ) is determined by the difference between birth and death rates of the population. In 1999 the U.S. Bureau of the Census estimated the rate of population increase ( r ) for the world human population to be 0.0129 (or 1.29 percent) per year. 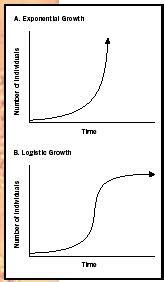 Few natural populations grow at exponential rates for extended periods of time because resources typically become limiting when population abundance is very high. The abundance of environmental resources determines the rate of population growth over time. U.S. Bureau of the Census, International Data Base. <http://www.census.gov/pub/ipc/www/worldpop.html> .